Getting to grips with this book is akin to those dreams one has when one knows it is important to run, to move fast, but cannot; a force holds one back; a binding, slowing force. It prevents independent flight and demands that one submit to the direction and timing of the dream. This can feel very threatening; what should be familiar (running, walking) becomes skewed, slanted and something alien and uncertain. Wilson takes what we might think of as a story and then percolates it through a filter of his own devising. He is either a genius or an egotist; or possibly both, as they tend to be twinned facets of one jealous breath of description, and we are forced to play the game and read the book on his lines. Those lines are non-sequiteur comments, lined up after another, seemingly with little connection and wildly descriptive, contrasting landscapes of potential meanings. Any reaction is entirely in the eye and mind of the reader. Funnily enough, I would be willing to bet that despite this people could read the same messages embedded in this crazed fictional landscape; that though the message seems garbled, the gist would be similar to most readers. Those that bear with it and finish it, that is. For those to whom it is impenetrable, this reaction has already sorted them from those who can claim to find a meaning and would follow in understanding. And as random as the narratives seem, I doubt that there would be too many randomised readings. What is most important here is a desire to capture a commonality of gestalt experience. That by the word-cues we find signification that plays with the structural assumptions of the world. For the most part life is predicated on structuralism: it is a format that the majority can understand and find solace in. even when structures seem to fail us; banks go bust, economies wobble, criminals are set free, yet these are the accepted flip-side of the structure: the negatives that affirm the desirable positives and give society a reason to try to reach the desirable side once again. Most books, too, are structural. Relating stories, from the oral tradition to the written, in order to keep temporal and geographical details coherent had to follow a structural pattern of an expected linear core. Those authors that do something different are the very ones lauded as 'different': their experiments are detected and judged on their suitability compared to the archetype. As the press release says, "masked in absurdity, these stories reveal the horrifying and hilarious faces of everyday life." Even this needs to tie the book to the run of the mill structural expectations of wider society. The press officer needs to explain the book in a shared, understandable phenomenology; these are 'masked' truths, 'absurdity' explains their non-linear progress. The press officer had the idea, as I did above, that these are stories with a broader appeal; that they can be understood on some level by 'normal' people. Added to this, they can be corralled into the normative experience by being commentaries on 'everyday life'. But when one actually reads them, this is not what happens. The phenomenology is one of a shared education, a shared society where certain values have been ascribed to words, so that playing with juxtaposition of word and narrative expectation the rawer meaning of those words: the collected experience of those meanings put together, is what forms the idea of understanding. This is not word-by-word understanding, but the bird's eye view from high above the pattered landscape of these words. One needs distance to make sense of it, or else one cannot see the wood for the trees. The most natural response is to see the stories as metaphor amongst the almost obscene verbosity of the writing. The exercise is stimulating for one or two stories in a row. A whole book of them is wearying. The book can become a tool for stimulation and exercise. As much as the very playfulness is an extension of an egotism of the writer at being so clever and witty in his form of writing, the reader is complicit in this self-assured show of superiority by utilising the written word as a touch-stone for mental training, gaining their own sense of superiority over those who would find the whole lot an unreadable mess. And then going beyond the format there is the spell of imagery. The most obvious comparison is that of Jungian dream examination. Yet the most obscure among the stories; those who seem to disappear up their own surrealistic behinds (e.g. 'Beneath A Pink Sun') create a saturation of words in the conscious mind to which the only reaction is to paint a dream-scape with a suspicion of semi-glimpsed logic as slippery to catch hold of as an eel. The natural reaction is to draw back to attempt to get a better idea of the wider picture, and this reaction means trying for meaning from the imagery. What meaning is found will be predicated largely on the experience of the reader; their personal phenomenon brought to bear on the story's. So to ask the question: is such word-play speculative? As it is subject to a reader's input in partnership to create the whole meaning, there is an objectification by the writer from what he writes. He does not present the whole tale. Unlike a story that is its own being whether or not it is witnessed by anyone other than the writer, these stories need their witnesses to be complete. The subjective act of taking a subject to heart to produce a writerly response is left half in the eyes of the beholder. Speculation is to move in a direction of enquiry; a direction the writer wishes the reader to follow. 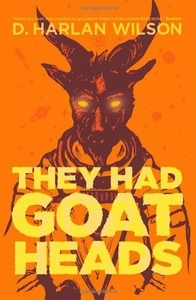 Goat Heads is a flight of fancy; a speculation in a direction of style over substance: an exercise in the way of writing, rather than the content. Not that the content is not important; with no inspiration there is no drive to begin writing at all and all writers are saying something. But since, as shown above, the content is more up for grabs in half of the compact between writer and reader, the style is paramount here. This is a speculation on form. Come that day Wilson manages to create work that can direct specifically examined content with all the obscure working-out of his current style, he will truly be a speculative giant, indeed.